Learn how to use your smartphone while traveling abroad with the following tips. Much like your Passport and plane tickets, your cell phone is an integral part of the travel process. Prepping your mobile phone for international travel doesn’t just allow you to communicate with loved ones back home. It can also help to simplify the journey and alleviate the common stresses of visiting a new country for the first time. Learn how to use your smartphone while abroad with the following tips. A month before your trip, contact your cell phone carrier and inform them that you will be traveling abroad. Ask about their global packages, and research the one that’s best for you before signing up. Some examples include AT&T Passport and Verizon Travel Pass. By contacting your carrier ahead of time, you can avoid a surprisingly expensive bill when you return home. If you don’t want to pay the extra charges for an international cell phone plan, switch your phone to airplane mode and rely on Wi-Fi alone. Your hotel is bound to have Wi-Fi, and many of the cafes, museums, and attractions you visit will also supply wireless internet free of charge. Use free global apps like Whatsapp to communicate with friends and family while you sip your morning cappuccino. 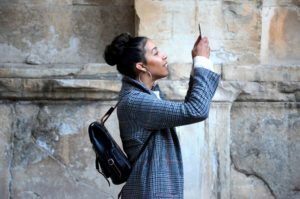 You won’t be able to communicate outside of a Wi-Fi zone, unfortunately, but this may encourage you to spend less time on your phone and more time enjoying the sites! If you’re planning an extended trip abroad, consider replacing your SIM card and using a local cell service provider. Call your carrier ahead of time to confirm that your phone is unlocked and can acquire a new SIM. When you purchase a new SIM card, you will also receive a local phone number and data. You can purchase a local SIM at the airport or typically at a small shop in the city center. This entry was posted on Thursday, September 27th, 2018	at 10:31 am	. You can follow any responses to this entry through the RSS 2.0	feed. You can leave a response, or trackback from your own site.